Concept-Art has become a household name with coffee lovers, baristas and professionals in the food and catering industry, even in many foreign countries. National and international clients alike appreciate Rexroth’s unwavering commitment to quality, service and customer satisfaction – as well as his friendly nature and his open ear for feedback and suggestions. 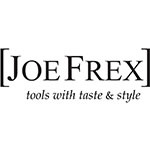 As part of this continuous quest and dedicated commitment to innovation, an updated company identity has recently been created under the new brand name [JoeFrex], which is intended to represent and epitomise all the traditional values and business principles of his company in order to boldly and uncompromisingly convey them into the future.